The Alps is a mountain range in Central Europe stretching from France in the west until Slovenia and Austria in the east. The highest peaks in Europe outside of the Caucasus Mountains are located in the Alps. Mont Blanc (4,810 metres), Dufourspitze (4,634 metres) and the world famous Matterhorn (4,478 metres) are well known alpine four-thousanders. Many areas of the Alps are covered by eternal snow and ice. The largest glaciers are located in the Valais and Bernese Alps of Switzerland. The Aletsch Glacier with its 23 kilometres length and 900 metres depth is now a UNESCO World Heritage site. Switzerland, Austria, Slovenia and Liechtenstein are often referred to as the alpine countries because much of their territories are geographically and culturally dominated by the alps. The regional provinces of Bavaria, (Germany) and South Tyrol (Italy) also offer a distinctly Alpine flair. The Alps have been the scenery of many of the Winter Olympic Games. Chamonix was the first host in 1924, other towns that hosted the games were St. Moritz (2x), Innsbruck (2x), Garmisch-Partenkirchen, Cortina d'Ampezzo, Grenoble, Albertville and Turin. The Alps are a result of the African tectonic plate crushing into the European tectonic plate, which caused the land to rise, and thus forming this 1,200 kilometre long string of mountains, dividing Italy from the rest of Europe. The Alps are divided in the Western Alps, with the highest peaks and the Eastern Alps, with slightly lower peaks. The dividing line is usually placed from Lake Konstanz (in German: Bodensee) in the north, and Lake Como in the south. There are also a lot of regional subdivisions, clustering groups of mountains. A lot of Europe's big rivers originate in the Alps, The Rhine, The Rhone and the Po all have their origins in the Alps. The Danube, which doesn't originate in the Alps, is fed by a lot of smaller rivers originating on the north side of the Eastern Alps, like the Inn and the Salzach. The Alps run across France, Italy, Switzerland, Liechtenstein, Germany, Austria and Slovenia. Swiss Alps (Bernese Highlands, Valais, and Graubünden) - A region which is one of the most recognizable symbols of Switzerland. The region covers around 65% of Switzerland's surface area (41,285 km²), making Switzerland one of the most alpine countries. The highest point of the Swiss Alps is Monte Rosa which rises to 4,634 metres above sea level. The region also is notable for containing around 1,800 glaciers, which includes also the longest glacier in in the Alps - the Aletsch Glacier. Austrian Alps (Vorarlberg, Tyrol, Salzburg) - The highest point of the Austrian Alps is Mount Großglockner which rises to 3,797 metres above sea level. French Alps - The region is also noted for its stunning beauty, including many alpine lakes, the largest being Lake Geneva (Lac Leman), Lac d'Annecy and Lac de Bourget; these lakes are year-round attractions for their beauty and access to numerous water sports. This region is also home to famous resorts towns Chamonix, St. Gervais, Albertville (1992 Olympic Winter Games), Grenoble (1968 Olympic Winter Games), and Annecy with its old city and lake. The highest point of the Alps is found here: Mont Blanc, which rises to 4,810 metres above sea level. Italian Alps (Northeast Italy, Northwest Italy) - The highest point of the Italian Alps is Mount Gran Paradiso which rises to 4,061 metres above sea level. Bavarian Alps (Germany) - The region, which only composes less then 10% of Germany's total area, is considered one of the most beautiful landscapes of Germany and ranks as one of the most scenic places in all of Central Europe. Julian Alps (Slovenia) - A large part of the Julian Alps is included in Triglav National Park. The highest point of the Julian Alps is Mount Triglav which rises to 2,864 metres above sea level. 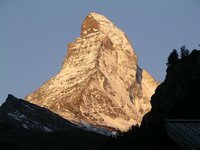 Skiing, snowboarding and hiking are obviously the activities done the most in the Alps, but there are also a lot of possibilities for some more extreme sports, like mountaineering, hang gliding, rafting, canyoning and bungee-jumping or just enjoying the scenery of some of the world's most Famous Mountains. There are a lot of big and smaller places in the Alps that are interesting for travelers. In summer Interlaken in Switzerland and Innsbruck in Austria are beloved destinations because of the scenery and the easy way to get there. In winter it is possible to ski or snowboard in almost every town. Mont Blanc is the highest mountain in the Alps, but it can be climbed. If you are in good shape, and have experience in mountaineering you can climb under the supervision of a guide to the top of the mountain. From Chamonix it's a two day tour that starts are the highest point the cable car can reach, the Aiguille du Midi. For most people a visit to the panorama point at the highest station of the cable car does just fine. The view from here is simply awesome. The ascent route from here descends to the Cosmiques Hut before traversing Mont Blanc du Tacul and Mont Maudit to gain Mont Blanc itself. The route is graded Alpine PD+ and climbs some steep ice sections. A slightly easier route from the French side ascends from Nid d'Aigle (the end of the Tramway du Mont Blanc from St Gervais) via the Tete Rousse and Gouter Huts. This way is the most popular but can be prone to danger from stonefall. Chamonix also has countless opportunities for the walker and the best known is the Tour du Mont Blanc or TMB which is the full circuit of the mountain taking around 2 weeks and passing through France, Italy and Switzerland. The longest glacier in the Alps (an UNESCO World Heritage Site), Aletsch Glacier lies in Switzerland not far from Brig. The glacier is 25 kilometres long, and there are cable cars going up the mountains from three of places in the Rhone valley: Mörel, Betten and Fiesch. Once on the top you have a great view over the glacier and the surrounding mountains. 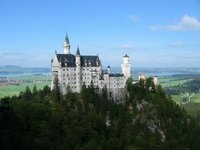 The Castle Neuschwanstein is the biggest legacy of King Ludwig II of Bavaria. The built of the castle started in 1868, and was completed in 1892 several years after the King died. The castle is that of a fairytale prince, and has become the inspiration for Walt Disney's Castle of the Sleeping Beauty, and it has been copied in some of the Disney parks. The castle itself was inspired on Opera's by Richard Wagner, especially the Opera Tannhauser, in which the Swan knight Lohengrin is the central figure. Seven weeks after the King died in 1886 the castle was opened for the public. It has become one of the European topattractions which is visited by around 1.3 million people every year. The castle is situated in the Alps of southern Germany (Allgäu), near the town of Füssen. Visits can be done pretty easy from Munich aswell. There are several tour operators offering daytrips, but you can also go by train and bus. Near to the castle also lies the castle of Hohenschwangau. The Jungfrau is located in central Switzerland, in the Berner Oberland and is one of the best known mountains in the country, along with the Matterhorn. At 4,158 metres it is the highest mountain of the massif which has the same name, the other moutains in the vicinity are the Eiger and Mönch. The Jungfrau Railway is the highest in Europe and brings you to a height of 3,454 metres above sea level within the Jungfrau-Aletsch-Bietschhorn World Heritage Site. It is not cheap but it makes for one of the highlights of a trip to the Swiss Alps. Although it is not the highest mountain in the Alps, the Matterhorn is considered to be one of the landmarks in this mountain range. It's distinct piramide-like summit is it's claim to fame. 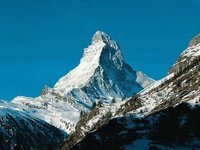 It's part of the Pennine Alps and it overlooks the towns of Zermatt (in Switzerland) and Cervinia (in Italy), but it's from the northside that we all know the well-known image of this mountain. Along the Swiss Italian frontier between Zermatt and Alagna Valsesia lies a group of ice clad peaks containing the highest mountain in Switzerland and Europe's highest mountain hut. In fact the next 4 highest peaks in the Alps - after Mont Blanc - are situated here. The massif is known collectively as Monte Rosa though on some maps that name is given to the central peak of Signalkuppe - the 3rd highest of the group at 4,554 metres. The highest point is Dufourspitze at 4,634 metres which lies just to the north and is the highest point in Switzerland. The main features of Monte Rosa are the vast Gorner Glacier which sweeps down from the northern ice fields towards Zermatt and the 2,000 metres high East Face - the so called Mirror Wall - which towers above the Italian Macugnaga valley and is the highest mountain face in the Alps. Ascents of the Monte Rosa peaks can be made from both the Swiss and Italian sides with the easiest routes being uncomplicated for a mountain of this size, though all involve glacier crossings so should be done with a guide.The route to Signalkuppe topped by the Margherita Hut - Europe's highest - is long and without dfficulty while Dufourspitze is slightly more technical on account of rock sections to climb in the latter stages. Germany's highest mountain, Zugspitze lies on the border with Austria. It can be accessed by a cable car, and has a restaurant and observatory on the top. Austria's highest mountain, Grossglockner can be seen from the much travelled Glocknerhochalpestrasse, a pass from the north to the south side of the main ridge. The road is a toll road that runs from Zell am See until Heiligenblut. Opened only in the summer months (from early May until October), the ice caves of Eisriesenwelt are one of nature's most attractive features in the Alps. As the name already says, inside the caves are ice formations in all kinds of beautiful shapes. The caves, which is the largest accessible ice cave in the world can be found in the mountains above Werfen (40 kilometres south of Salzburg.) The caves are only open for public in summer and early autumn. Their location near to Salzburg, make them a very good daytrip for people staying in the city. Innsbruck Airport. There are other airports that are situated not far from the mountains, like: Salzburg Airport, Klagenfurt Airport, Orio al Serio International Airport in Bergamo, Friedrichshafen, Geneva Cointrin International Airport, Grenoble and Turin Airport. Flughafen München Franz Josef Strauß (Munich), Zürich Airport and Milan Malpensa International Airport might be a bit further away, but have more international flights. While the Alps are rather centrally located within Europe, they have been a barrier to all types of travel for millennia. The nineteenth century brought with it a number of still impressive technological feats "taming" the Alps. While there are currently efforts to replace some tunnels and bridges with newer, shorter and faster routes, some passes are still used by trains today. The adjacent railways all offer various international tickets into and out of the Alps, most notably Deutsche Bahn, SNCF and ÖBB (Österreichische Bundesbahnen). While the Swiss national railways enjoy a very good reputation, they are rather new to the international business, though there are cooperations with SNCF and DB. For most international tickets special offers are available if you book early and/or avoid peak periods like weekends or holidays. Long distance buses are still mostly a new concept west of the former "iron curtain" and thus getting into the Alps from outside the area can be difficult and expensive. There are of course Intercity buses in Germany serving hubs like Vienna, Zürich or Salzburg and during the ski season chartered buses clog the streets with ski-groups, but other than that options can be sparse. Intercity buses in France have also become available in recent years. In Switzerland the "Postauto" has long been a mainstay on mountain roads and a crucial link to the rest of the country for those places not served by any railway. The Alps can easily reached along very good highways from most countries in the region and the rest of Europe. Many highways you have to pay toll, but there are great alternatives on secondary roads, winding its way into the lower hills and finally the higher mountains in the central Alps. Driving is often a practical way for getting around, especially on the countryside. The roads often get very congested in July and August when people from further north head to the beaches of the Mediterranean. The same goes for the ski resorts in winter (though minus the travel trailers). In the winter many mountain roads are closed to traffic and copious amounts of snowfall may mess up the traffic. Due to the high costs associated with tunnel building, some railway-only tunnels have trains carrying cars and their passengers running through them. Depending on your itinerary, taking such a train can save you a lengthy detour, time, money or a combination of all three. Sometimes making use of these offers lets you avoid toll roads. Both Switzerland and Austria as well as Slovenia have a flat rate toll system where you pay once for a certain amount of time (in Switzerland the shortest possible period is one year, in Austria it is ten days with the next shortest being one month, in Slovenia it's one week) to use all normal highways, though there are roads that cost extra (and can in theory be used even by those not paying the general toll). In Italy and France there are distance based tolls and in Germany there is (as of 2016) no toll for passenger cars. Trying to avoid toll roads is not only difficult and making your trip longer than it has to be but usually not worth it in terms of money either. Like elsewhere in Europe, train may be the best kind of public transport. If you like rail travel through scenic landscapes, the Alpine countries are certainly worth considering. However in some cases train travel may take longer than you expect as the terrain forces all travel to take long detours. For instance, considering the straight-line distance from Geneva to Turin a train ride between those cities takes ridiculously long. Some major routes are currently upgraded with new tunnels and bridges for that reason, but construction is expensive so some routes will still be circuitous for the time being. Switzerland in particular has an excellent rail network with very good on time performance and one of the densest networks in the world. However, there are surprisingly few high speed lines and prices can be expensive as one in four Swiss people has a half fare travelcard, reducing prices 50% and fares are calculated accordingly. Add the general wealth of Switzerland to the equation and you will have to shell out quite some money for good service. Smaller places, especially in Switzerland, are often connected by (post) buses to larger towns. The cuisine in this region developed to rely on dairy and imported dry ingredients when fresh food was scarce during the winters. Melted cheese fondues of many types are available, as well as Muesli and chocolates. A typical alpine thing to drink is liquor with herbs and spices that grow in the area. This is version 46. Last edited at 8:57 on Aug 10, 17 by Utrecht. 55 articles link to this page.